Socks are often the unsung heroes of a hunter's clothing. They take a lot of abuse, and are expected to provide comfort and durability during a lot of rough treatment. Farm to Feet socks can deliver all of that and more, and they're 100% made in USA using all-American materials and labor. Farm to Feet socks are 100% American, made in the USA by American labor using American materials - including the packaging. All Farm to Feet socks are made with U.S. grown merino wool sourced from American Sheep Industry ranchers. The Nylon and Spandex they use are also produced in the United States of America. Guaranteed for life: "If you are not completely satisfied with the durability or performance of your Farm To Feet socks, then please return them for a replacement or a refund." Made in a variety of styles; 28 styles were listed on the Farm to Feet website at the time this review was published. I tried three styles: Englewood, Hickory, and Ansonville. Englewood is an extended crew height, medium weight sock. Full density cushioning throughout the leg and foot. "Designed for the outdoor sports enthusiast, it can be worn while enjoying the outdoors or as a stylish option to wear every day." Kept my feet warm (most of the time), but not too hot. Made in the USA - completely, including the packaging and all materials. Hickory is an over-the-calf, heavy weight sock. Full density cushioning throughout the leg and foot. Farm to Feet call it a "wader sock." Ansonville is an over-the-calf, medium weight sock. Full density cushioning throughout the leg and foot. "A great option for the sporting enthusiast to wear with a pair of waders or hunting boots." It's not often that I feel a glow of pride for something that I'm reviewing... and I'm not sure just how to feel about it when I do. After all, reviews should be unbiased, right? But I always have given honest assessments of all of the products I review on this site, and that's not going to stop now. Farm to Feet makes me proud because they make very good products - I have happily used their socks for many hours of hunting - and they make them entirely in the USA with all-American materials and all-American labor. And while they're not cheap, neither are they terribly expensive. Being an American patriot, I like that. I tried three Farm to Feet styles: Englewood, Hickory, and Ansonville. All performed well and none disappointed me. After many hours and miles in the woods, they never drooped or sagged, and they still pretty much look like new. I wore all of these styles with Bogs Copperhead rubber hunti﻿﻿ng ﻿﻿boots, as well as lace-up hunting/hiking boots. They performed well in all cases. Here's the scoop on the styles I used. The Englewood may be my favorite of the Farm to Feet styles - at least for warmer hunts and casual use. The deer emblazoned on the side is a nice touch. This style is described as "extended crew," and because of that I wondered whether it would stay up. After all, crew socks are probably the worst about sagging, due to the natural taper of the human leg. I also felt that they were a bit tight the first time I put them on, and I wondered whether they would be too tight. I needn't have worried; they stayed up just fine despite a long walk to my deer stand (and many other long hikes on subsequent hunts), and they never felt too tight. When it comes to cold weather, the Hickory is my favorite of these styles. Although my toes did get a little chilly at times, I found them to be comfortable for long periods of time - such as the day my nephew bagged a buck, when I wore them without complaint from 5:00 AM until midnight. And at the end of that long day, my Farm to Feet socks smelled better than the cotton socks I'd worn for shorter periods of time on the previous two days. In cold weather, I like an over the calf sock, and these provide that extra warmth for my leg without sagging or being too tight. Although medium weight rather than heavy weight, Ansonville socks kept my feet warm on some chilly mornings, but sometimes fell a bit short when it was good and cold. On two morning with temperatures in the 20s, my feet stayed warm for a more than four hours on a deer stand, and again during a turkey hunt. On another occasion when the temps were in the mid 30s, my feet got cold in the stand. Like Hickory, they stayed up above my calf just fine. 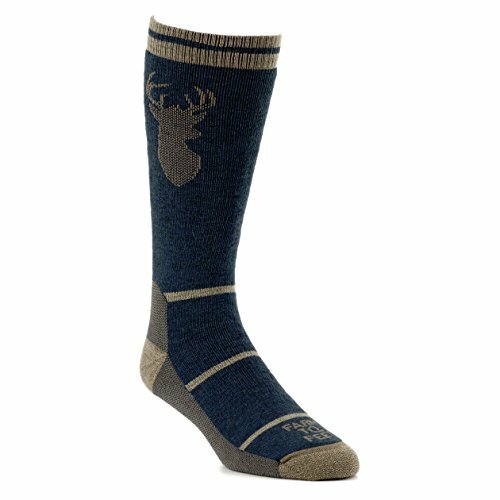 I like these socks for most of my hunting, although I may turn to others on very cold mornings in the future. Quality and durability are superb, and they look good as well. I can say confidently that Farm to Feet socks will definitely be part of my hunting gear for years to come, and I hope the company thrives as it continues to make high quality all-American products here in the good ol' USA.